Hope. In the beginning 21 year-old Kelsey Westbrook was your average, hardworking student and part-time waitress at Joe’s Crab Shack, overlooking the Ohio River. 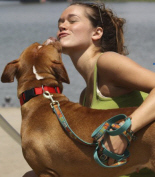 She was a true animal friend, animal lover and dog parent. Little did she know that her life would change on an average day, on an average shift, in a not-so-average way. We read about Kelsey’s heartwarming story on an animal lover’s blog and have reposted it here to share with you! During one of her shifts at the restaurant, Kelsey and her fellow employees heard a loud “splash!” Running out to the river and under the 80 foot bridge nearby they saw a helpless and stunned dog swimming anxiously in the cold water. Everyone started to wave the dog in and encouraged the frightened pooch to swim toward them. The Louisville Fire Department dive team was practicing nearby and rescued the dog. When they finally retrieved the dog out of the river, she started licking everyone and seemed relieved. Miraculously, the dog appeared to be unhurt. Kelsey took the dog home that day, and later, to a veterinarian who estimated that the pit bull was less than a year old. Kelsey planned to find the dog a good home, but changed her mind. “After a day, I thought, ‘Nope, she’s mine. I have to keep her,” says Kelsey. Love. Perhaps it was destiny, fate or just a lucky day, but what brought this pair together was not average. According to many sources, USA Today, NY Times, BNET, The Star, and HSUS millions of dogs [and cats] are improperly and inhumanly killed around the world. According to the National Council on Pet Population Study and Policy, roughly 9.6 million animals are killed annually in the United States. Many of these fates occur at the shelters due to space issues, however many animals do not make it to the shelter and are not “humanely” killed. This would have been Sunny’s fate, except she was in the right place at the right time, and so was Kelsey. Sunny was brought to her forever home and quickly bonded with her new canine sister and family. But then, the day after Sunny’s harrowing rescue, Kelsey’s landlords notified her she had two days to remove Sunny from the apartment. Areté Real Estate, the company that owns Kelsey’s apartment complex, insisted pit bulls are a “vicious breed” and not allowed on the premises. Pitbulls get so much negative attention and even though this dog was saved and gratefully kissed everyone that was involved with her rescue, she was still considered a “vicious breed.” Even with all of the heat from her landlord, Kelsey vowed to be Sunny’s forever home and promised to do whatever it took to ensure Sunny’s safety and well-being, even if that meant finding a new place to live. But once again fate would smile on Sunny and Kelsey: while she was trying to negotiate with her old landlord, a new management company took over her building, and Sunny was welcome to stay. Next Week, Part II: Karma.